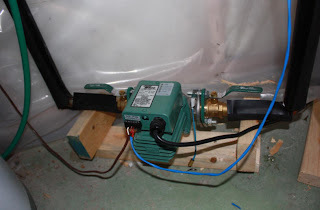 Thanks to Sean for providing this report on using the new Taco pump that has a built in differential controller and uses variable speed to control flow rate. The pump is intended for solar water heating systems -- it eliminates the need for a separate differential controller, simplifies wiring, and also offers the advantages of varying pump flow to match collection conditions. AC Unison has announced that they will be offering an easy to install PV system that incorporates a microinverter within each of the PV modules. They do not provide a lot of detail on the installation, but the data sheet lists the nominal voltage as 240VAC 60 Hz -- so, I'm not sure how it integrates with the house power. About installation, it says "The integrated AC design of AUO AC Unison modules means the system installers only need to deal with AC connections. This makes the system installation simpler and faster. It is estimated to reduce installation time and costs by ¼ or more." About expansion, it says "Modules can be added to the existing system one-by-one in the future as budget for the homeowner increases." They also describe a data logger/gateway device and an online monitoring service -- apparently similar to the Enphase systems. I did not see any mention of price or availability. Its still unclear to me to what extent the power utility and building code inspectors need to be involved in this kind of an installation. This is an interesting study done by Berkeley Labs on how the sale price of your home might be effected if you install a PV system. The increases reported are surprisingly large -- on the high end, they are greater on a dollars per watt basis than what my system cost to install. I'm not at all sure I believe the numbers, but its nice to know that there might be some benefit when you sell your house to having a solar system. It might also make it worthwhile to document how the system works and the resulting savings for potential buyers. If you know of any other good ones, please let me know. I used the Taco 007 in my "appleseed" biodiesel processor. I find it barely has enough lift to empty the processor into the settling tank -- about eight feet. I'm switching to Grundfuss pumps, which have more lift. Perhaps I'm abusing the pump by using it with vegetable oil, but I haven't been able to find any other pumps that work well at 50C. I burnt out a couple water pumps because they couldn't take the heat. Hi -- you might email Taco support -- they have a good technical support department and they do answer emails. They might be able to recommend a better pump for oil? I use a oil pump from an old v-8 ford engine powered with 1/2 electric motor to transfer trans fluid. price was right(free)it works great and will last for ever. Send in those project updates! !